Korea is increasingly being benchmarked by developing nations around the world for everything from e-government to nuclear safety. Moreover, as the only nation to move from being a recipient of OECD aid to the status of donor nation, Korea offers an enviable model for those trying to imagine a better future. At the same time, some profound changes will be necessary at multiple levels for Korea to realize its full potential and lead the way to a better future. If there was an American dream for the developing world in the 1960s, what would be the “Korean Dream” for the current age? This discussion consider Korea’s new role as a development partner within the context of current trends towards global integration. 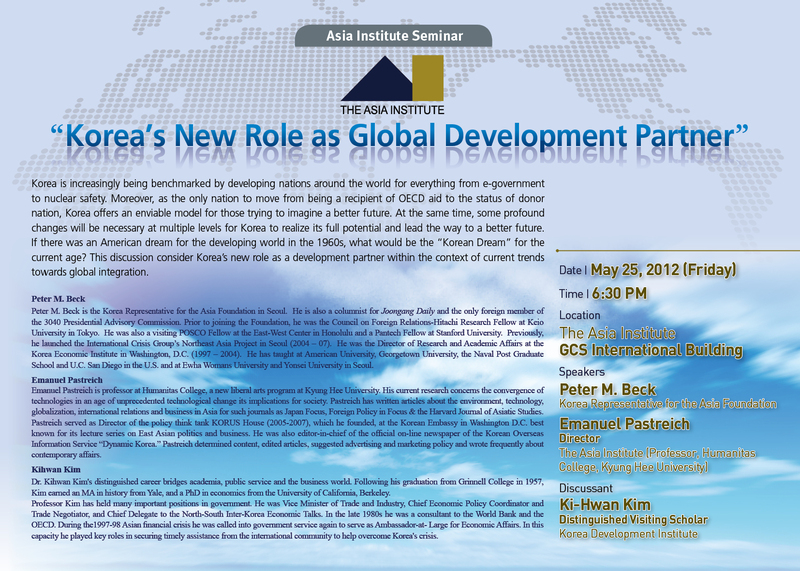 Peter M. Beck is the Korea Representative for the Asia Foundation in Seoul. He is also a columnist for Joongang Daily and the only foreign member of the 3040 Presidential Advisory Commission. Prior to joining the Foundation, he was the Council on Foreign Relations-Hitachi Research Fellow at Keio University in Tokyo. He was also a visiting POSCO Fellow at the East-West Center in Honolulu and a Pantech Fellow at Stanford University. Previously, he launched the International Crisis Group’s Northeast Asia Project in Seoul (2004 – 07). He was the Director of Research and Academic Affairs at the Korea Economic Institute in Washington, D.C. (1997 – 2004). He has taught at American University, Georgetown University, the Naval Post Graduate School and U.C. San Diego in the U.S. and at Ewha Womans University and Yonsei University in Seoul. Emanuel Pastreich is professor at Humanitas College, a new liberal arts program at Kyung Hee University. His current research concerns the convergence of technologies in an age of unprecedented technological change its implications for society. Pastreich has written articles about the environment, technology, globalization, international relations and business in Asia for such journals as Japan Focus, Foreign Policy in Focus & the Harvard Journal of Asiatic Studies. Pastreich served as Director of the policy think tank KORUS House (2005-2007), which he founded, at the Korean Embassy in Washington D.C. best known for its lecture series on East Asian politics and business. He was also editor-in-chief of the official on-line newspaper of the Korean Overseas Information Service “Dynamic Korea.” Pastreich determined content, edited articles, suggested advertising and marketing policy and wrote frequently about contemporary affairs. Dr. Kihwan Kim’s distinguished career bridges academia, public service and the business world. Following his graduation from Grinnell College in 1957, Kim earned an MA in history from Yale, and a PhD in economics from the University of California, Berkeley. Professor Kim has held many important positions in government. He was Vice Minister of Trade and Industry, Chief Economic Policy Coordinator and Trade Negotiator, and Chief Delegate to the North-South Inter-Korea Economic Talks. In the late 1980s he was a consultant to the World Bank and the OECD. During the1997-98 Asian financial crisis he was called into government service again to serve as Ambassador-at- Large for Economic Affairs. In this capacity he played key roles in securing timely assistance from the international community to help overcome Korea’s crisis.